When researching First Nations genealogy, estate files can be a valuable source of information. Estate files are held at Library and Archives Canada (LAC) in the Department of Indian Affairs and Northern Development (DIAND) fonds, known as RG10. The Department, now known as Crown-Indigenous Relations and Northern Affairs Canada and Indigenous Services Canada, continues to administer “the estates of deceased Indians” as per the Indian Act. The contents of estate files vary. These forms record vital information on the deceased, summaries of land and personal assets, summaries of debts, and vital information on heirs and next of kin. The types of information found in these files can be very useful when conducting genealogical research. Before you begin researching, record the information you already have in a pedigree or family chart, both of which are available on our website. You can use any information you find in the estate files to fill in the blanks. How do I identify estate files held at LAC? RG10, 1996-97/816, box 91, file “Estate of Clifford Leonard – Kamloops,” 1928–1948. 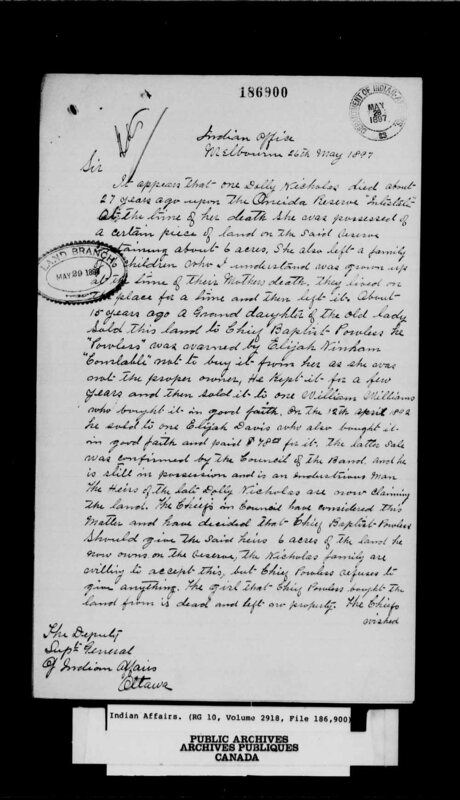 RG10, volume 11266, file 37-2-8, “ESTATE NELSON, JOB,” 1928–1929. 2017-00390-5, box 4, file 411/37-2-179-48, part 1, “Estates – P. Meneweking – Spanish River,” 1946–1967. These examples show the different title formats used by estate files. Researchers can search by family name, with or without the given name (first name). Sometimes the band name is included. Aside from file classifications, this type of research is one of the few cases where searching by the name of an individual is the best method for identifying a relevant file. It is best to begin your search in our archival database, Archives Search. If you are unable to identify a file for an individual described in our database, do not worry. Many files are not described at the file level in our database. To identify these files, try another search with keywords “estate” AND the name of the band or agency of the deceased individual. For example, complete a keyword search for “estate” AND “Sudbury” in two separate fields and submit. A long list of results can be filtered by hierarchical level on the left-hand side of the page; in this case, choose Accession. One of the results, 2017-00390-5 “Estate Files of the Sudbury District Office,” 1900–1983, is an example of a set of 18 boxes of records comprised almost exclusively of estate files, with no descriptions at the file level. In these instances, check the Finding Aid section for information on how to access a file list. In this case, the finding aid (or file list) is not linked to the description, but it can be consulted in person at 395 Wellington Street in Ottawa, or you can write to us and ask that we check it for a specific name. Doing this extra step beyond the keyword search for the deceased individual’s name, and including your work in your written request, can help Reference Services staff triage and treat your request more efficiently. How do I access estate files held at LAC? You will find that access is restricted to most estate files held at LAC for privacy reasons. Please make an access request online. Some early files are open. Of those, some are available on digitized microfilm, for example: RG10, volume 2918, file 186,900, “CARADOC AGENCY – ESTATE OF THE LATE DOLLY NICHOLAS OF THE ONEIDA BAND,” 1897–1898. If an open file is not available online, please request the original for Retrievals and Consultation. This information should help you to identify and access estate files held at LAC. To ask a question about estate files or on any other topic, please write to us! Rebecca Murray is an archivist in the Reference Services Division at Library and Archives Canada. 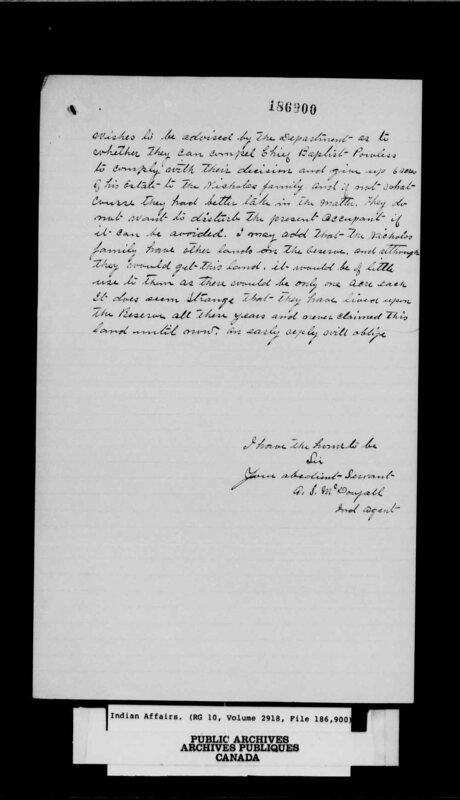 This entry was posted in Consultation and Reference Services, Genealogy & Family History, Indigenous Resources, Our Collection and Facilities and tagged estate, First Nations, Genealogy, RG10 by Library and Archives Canada Blog. Bookmark the permalink.